Good morning polished world! How are you all today? If you live in the Buffalo, NY area, I hope you are all safe and warm after that heavy lake snow. Goodness gracious, the photos are crazy, and I'm so happy that I didn't get hit where I am! It's crazy how early in the season it is and already places are getting slammed like that! What can you do though!? I also want to apologize that I didn't post alongside the Twinsies yesterday for Twinsie Tuesday. I did next weeks prompt by accident and had no time to re-create a design for this week. I will be back next week though for sure! Today though I am posting with the lovelies from The Beauty Buffs. This week we are focusing on all things metallic. I don't have many metallic polishes because I'm not really fond of the finish on my nails. 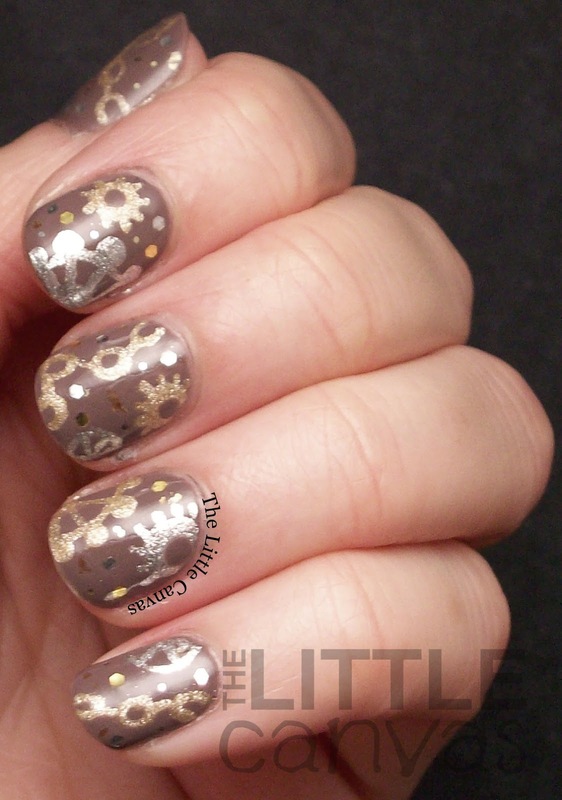 I was planning on doing a tape design using Essie Nothing Else Metals as a base and a black top, but I loathed how it looked. That polish was so difficult to apply so it was lumpy and uneven, and since it is a metallic polish, it is very unforgiving if you have one single thing go wrong. So I went to the drawing board and thought of different nail art that I could do using metallic polishes! I asked one of my friends and they suggested Steampunk! I did a quick search online for ideas and found an awesome tutorial on YouTube by Arcadia Nail Art (my internet is not working right at the moment so I cannot link it without freezing my whole computer). Awesome, right? I started off with a base coat of Zoya - Normani. This polish is from the first Natural collection, and it is quite amazing. 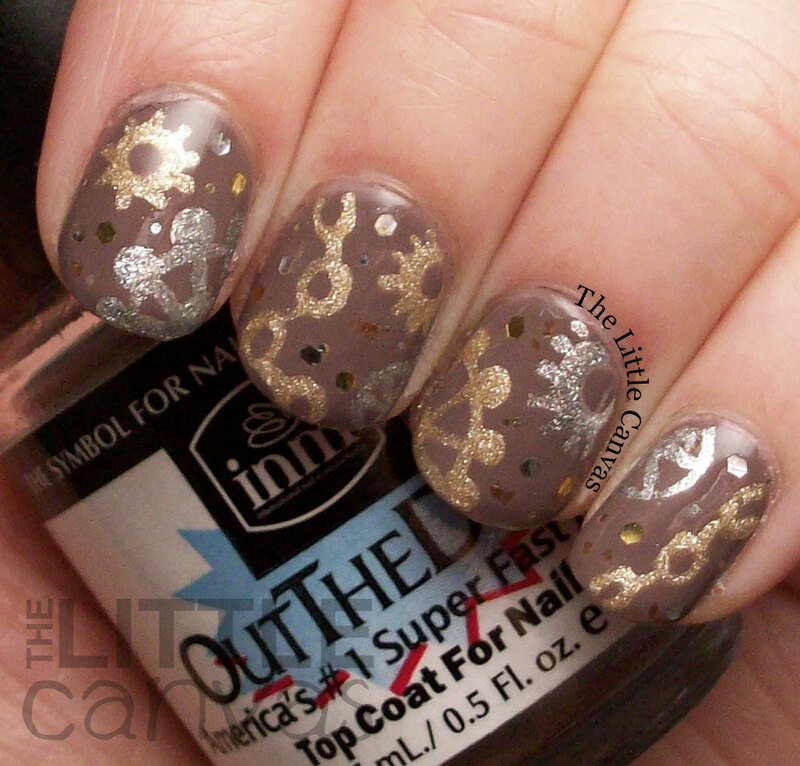 A perfect base for this type of nail art! It applied evenly in two coats. 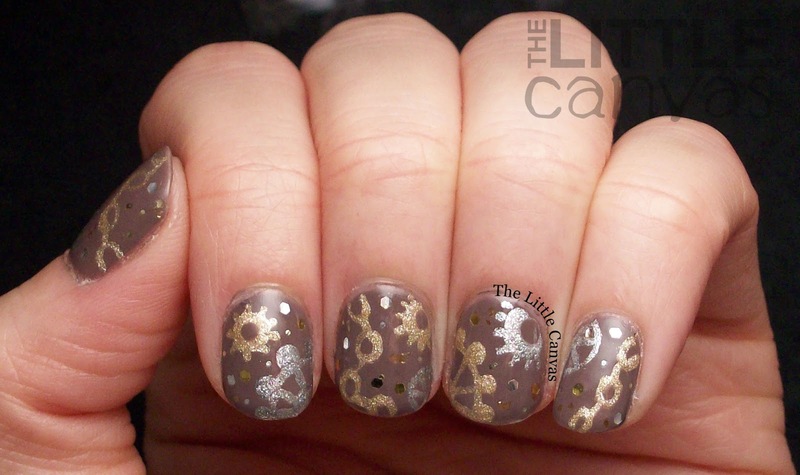 Using some new nail art brushes, I painted on the gears and chains using the metallic silver and gold polish. Glitz and Glam is part of FingerPaints Holiday Glitz Manicure Kit which I will be posting a review of soon. It is an awesome full coverage silver metallic polish which stood out perfectly on this base. Now I do not own a bottle of silver or gold large fleck glitter, so to do the glitter placement on these nails, I dug through a bottle of Ulta Pinata Yada Yada. I was rather dedicated to getting the most metallic look possible, and the glitter really made that more possible! 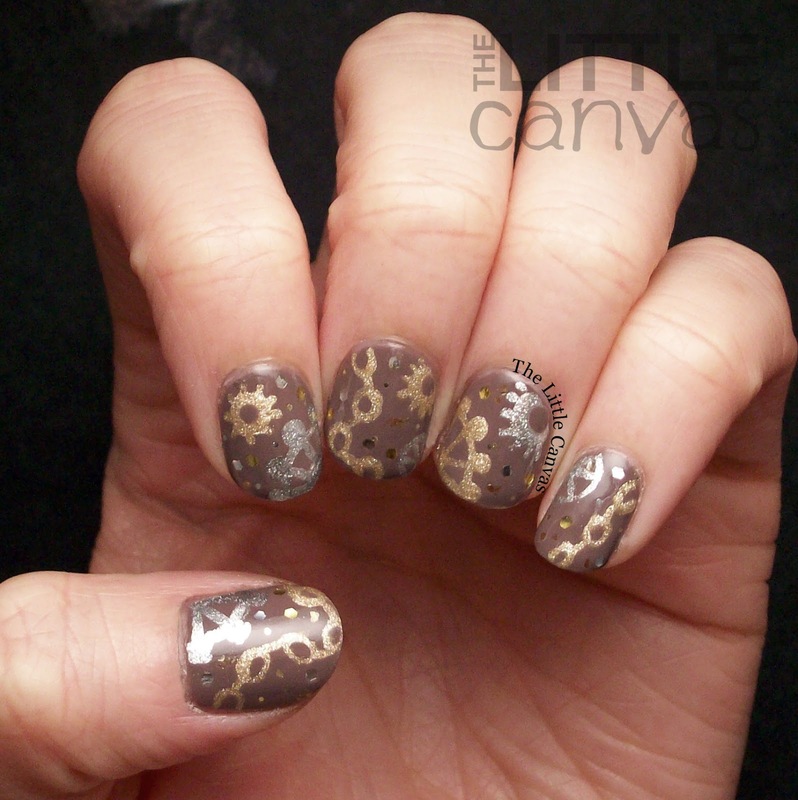 I love doing art with metallic/foil polishes on a cream base. They really stand out and add a whole new dimension to the art! I'm very happy that my friend suggested this design also, because it was something I never would have thought of in a million years! I cannot tell you how much I love this design! What do you think? Liking the steampunk look? 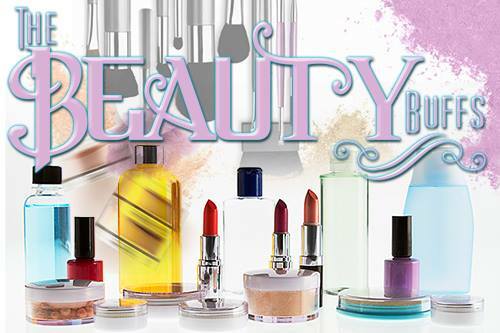 Do not forget to check out the other Beauty Buffs posts!